Drain the peaches and slice each piece into four. Pour the syrup into a large pan and add the honey, vinegar, spices and lemon rind. Boil briskly for 5 minutes. Pour over the peaches. Cool, cover, chill and leave for 24 hours. Place the gammon in a roasting tin. Spoon 4tbsp of the kumquat brandy flavoured syrup over the top. Cover and seal with foil. Cook in a preheated oven 180°C, gas mark 4, allowing 55 minutes per kg plus 25 minutes. About 20 minutes before the end of the cooking time, remove from the oven and increase the temperature to 190°C, gas mark 5. Drain off the juices, remove the string and peel the skin from the gammon. Using a large, sharp knife score the fat with cuts to form a diamond pattern. Mix the glaze ingredients together and spread the mixture over the gammon fat and stud with the cloves. Return, uncovered, to the oven for 20 minutes until the surface has turned golden brown. Bring the peaches to room temperature. 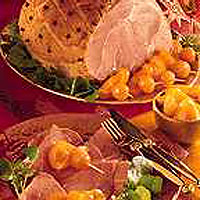 Place the meat on a serving platter and serve cold with a selection of salads.